TPCO(biggest seamless pipe producer in the world) was founded in 1989, Seri was founded at the same year as TPCO subsidiary engineering company first. CERI(Capital Engineering & Research Incorporation Ltd, founded in 1951, biggest metallurgic engineering company in China) became anthoer share holder of Seri in 2004. After 27 years development, Seri has over 2,500 employees now, plant area over 520,000 sqm. Seri can produce all kinds of equipments/machines, tools(mandrel and roller) for metallurgic business, hydro power and wind power field. 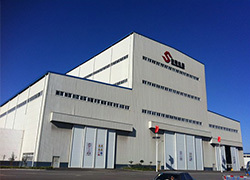 Seri became major Chinese supplier of many European companies since 2004. Seri has all kinds of certificate such as ISO 9001, ISO14001, API, IACS, GB/T28001, IIW.